People love The Oregon Trail. In recent years, indie developers have introduced their own twists on the classic (yet brutal) formula, most commonly modernizing the setting with the zombie apocalypse, as opposed to migrating to the Wild West. 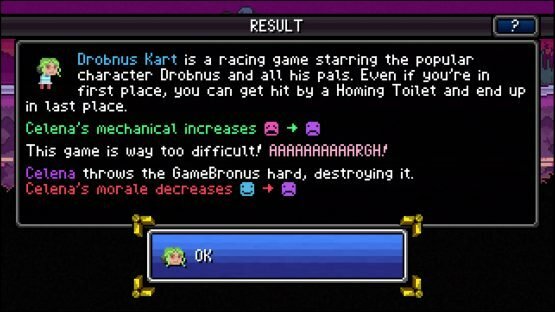 Organ Trail is probably the most popular of this new wave of games, undoubtedly helped by its clever title, but it’s not the only title of its ilk. Death Road to Canada released on PC and mobile devices last year to rave reviews, but now it’s making the jump to PS4. How well does this play on The Oregon Trail stand up to the console crowd? 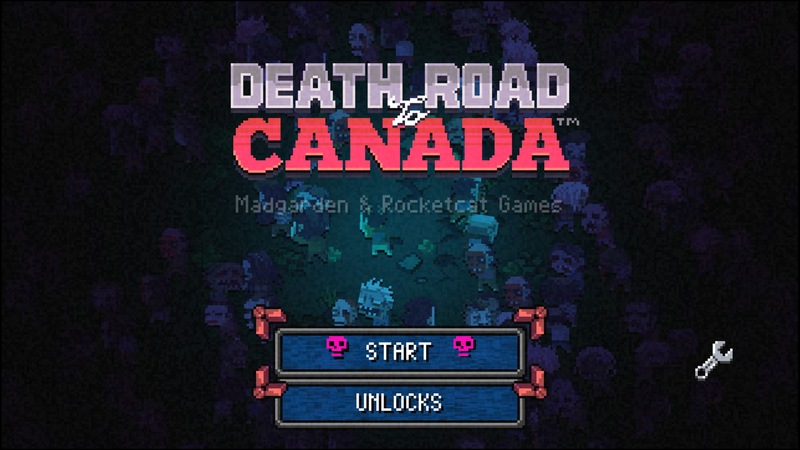 Starting up a game of Death Road to Canada is easy enough. Just start up the game, pick your character and their partner (I go for the randomized characters), and go. You can even create your own custom characters, in case you want your friends and family to die horrible deaths in the zombie apocalypse. Like any good twist on The Oregon Trail, you’ll be subjected to random events while getting to Canada. Some of these events can be helpful, by the way of more characters or more precious resources, but mostly the events have a good chance of harming you, unless you know the correct way out of a situation. Or, you could just get attacked by a feral cat, which you consequently can do nothing to stop it clawing one of your friends’ faces. This may sound brutal and unforgiving, and in a way it is, but Death Road to Canada lightens the frustration up a bit with its quirky humor and upbeat soundtrack. I can’t be too upset about my car flipping over and killing everyone but the dog when said dog also happens to be a pug, that’s a fantastic mechanic. Despite my multiple failures, I kept coming back for more, as sessions tend to be quick and enjoyable, even if they all end in some gruesome death or another. One thing Death Road to Canada does a bit differently from its peers is that it provides more action-based gameplay for a lot of its scenarios. You won’t just read about how Charlene got mauled by a zombie hoard in the middle of the night, you’ll see that happen in real time, and it’ll probably be your fault she’s dead, too. When scavenging for resources on your journey, you’ll have to protect yourself from the zombies in the vicinity, usually by hitting them with a blunt object. You’ll be able to hold onto three weapons at once, and each weapon has its own attack power as well as how tired it’ll make the character swinging it feel. You can’t just swing most weapons around constantly; do that and your character will do less damage and take a lot longer in between swings. Learning when to attack and when to run is integral to survival in Death Road to Canada, and usually the answer is the latter. When you die, usually the run isn’t a complete waste. By surviving particularly dangerous situations or exploring particularly well, you’ll earn Zombo Points. You can use these points after death in order to strengthen innate skills and more, making your next trip slightly more survivable. It’s a nice touch, and offers a reason to keep pushing through playthroughs and slowly make your characters better. There’s also a bunch of different modes you can try out, although only a few are available from the get-go. 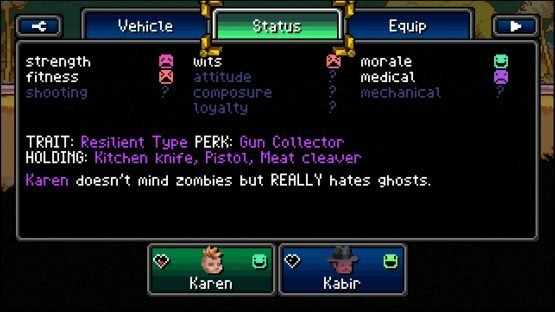 In addition to the normal mode, there’s a Rare Characters mode, wherein you can recruit strangely familiar but (usually) powerful characters to make Death Road to Canada a bit easier. You can also embark on shorter and longer trips, and eventually some really crazy modes unlock, but those are only for those with strong wills and a lot of patience. I had a lot of fun with Death Road to Canada. The title can really sink its zombie teeth into you, inviting you to do just one more playthrough before calling it quits. Everything about the package comes together well. Even though the developers could have taken shortcuts and brushed issues aside as nostalgia for The Oregon Trail, they instead gave us a game that invokes that nostalgia while improving upon the old formula. Death Road to Canada review code provided by publisher. Version 1.01 reviewed on PlayStation 4 Pro. For more information on scoring, please read our Review Policy.